The UK, Germany, India, and the United Arab Emirates are among the countries resisting US pressure to ban Huawei. The New York Times reports U.S. Campaign to Ban Huawei Overseas Stumbles as Allies Resist. Over the past several months, American officials have tried to pressure, scold and, increasingly, threaten other nations that are considering using Huawei in building fifth-generation, or 5G, wireless networks. Mike Pompeo, the secretary of state, has pledged to withhold intelligence from nations that continue to use Chinese telecom equipment. The American ambassador to Germany cautioned Berlin this month that the United States would curtail intelligence sharing if that country used Huawei. But the campaign has run aground. Britain, Germany, India and the United Arab Emirates are among the countries signaling they are unlikely to back the American effort to entirely ban Huawei from building their 5G networks. While some countries like Britain share the United States’ concerns, they argue that the security risks can be managed by closely scrutinizing the company and its software. The United States is not ready to admit defeat, but its campaign has suffered from what foreign officials say is a scolding approach and a lack of concrete evidence that Huawei poses a real risk. It has also been hampered by a perception among European and Asian officials that President Trump may not be fully committed to the fight. Mr. Trump has repeatedly undercut his own Justice Department, which unveiled sweeping criminal indictments against Huawei and its chief financial officer with accusations of fraud, sanctions evasion and obstruction of justice. Mr. Trump has suggested that the charges could be dropped as part of a trade deal with China. The president previously eased penalties on another Chinese telecom firm accused of violating American sanctions, ZTE, after a personal appeal by President Xi Jinping of China. One senior European telecommunications executive said that no American officials had presented “actual facts” about China’s abuse of Huawei networks. The American ambassador to Germany, Richard Grenell, wrote a letter a letter to Berlin, warning of repercussions should it use Huawei. Germany politely told the Trump administration to go to hell according to the Times. in its report Drop Huawei or See Intelligence Sharing Pared Back, U.S. Tells Germany. In a letter to the country’s economics minister, U.S. 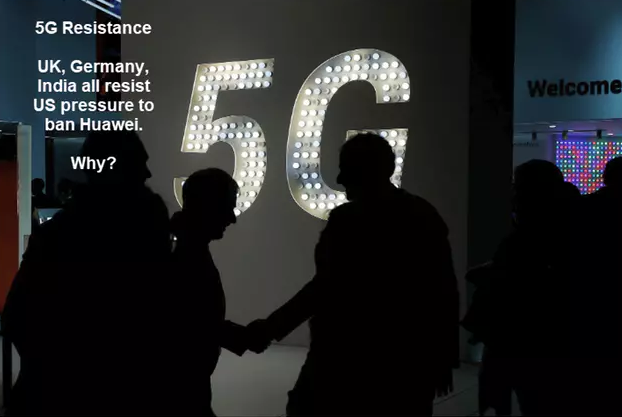 Ambassador to Germany Richard A. Grenell wrote allowing the participation of Huawei or other Chinese equipment vendors in the 5G project would mean the U.S. won’t be able to maintain the same level of cooperation with German security agencies. The letter marks the first known time the U.S. has explicitly warned an ally that refusing to ostracize Huawei could lessen security cooperation with Washington. Among other things, European security agencies have relied heavily on U.S. intelligence in the fight against terrorism. Mr. Grenell’s letter notes that secure communications systems are essential for defense and intelligence cooperation, including within the North Atlantic Treaty Organization, and that companies such as Huawei and state-controlled ZTE Corp. could compromise the confidentiality of these exchanges. His letter noted that under Chinese legislation, Chinese companies could be compelled to assist their country’s vast security apparatus without any democratic checks and balances, and that it would be impossible to mitigate that risk. He also noted that the code running on 5G equipment would need frequent updates and was so complex that the potential for so-called backdoors and other system vulnerabilities couldn’t be ruled out even if Huawei were to let regulators regularly inspect its software. Huawei, which is an employee-owned company, has strongly denied that it has ever spied for the Chinese government or would consider doing so. There is no evidence. Germany’s concerns are understandable. Germany uses Huawei equipment for its 4G network. To be backward compatible, Germany needs to use Huawei for 5G. Other vendors would be far more expensive. Selecting another vendor might set Germany back two years. The number of Trump’s demands on the EU have escalated and the EU is sick of Trump’s sanctions, meddling, and overall pettiness that isn’t consistent or believable in many cases. I side with Germany on all counts. But it’s a Financial Times article that really explains what’s going on. “The proliferation of our technology hampers American efforts to spy on whomever it wants,” says Huawei executiuve Guo Ping in an Op-Ed article US Attacks on Huawei Betray its Fear of Being Left Behind. Ping points out that the US’s NSA sought to “collect it all”, every phone call or communication in the world. On March 6, the Financial Times reported Huawei Lawsuit Accuses US of ‘Unconstitutional’ Equipment Ban. It’s not fear of Chinese spying, but rather Huawei will make US spying more difficult. The top secret documents leaked by whistle blower hero Edward Snowden prove the US spied on anything and everything including Chancellor Merkel. Secondly, China invested far more in 5G technology than the US. Eliminating Huawei is one way to catch up. Germany protested not only because Huawei would be backward compatible and cheaper, but also because there was no other competition that had Huawei’s features, at any price. It is not surprising in the least that the US has conjured up fantasies that are roughly 180 degrees opposite of the view it presents in its bullying efforts. Despite demands of evidence by China, Germany, the UK and other countries that China poses a risk, the US has not shared a shred of evidence with anyone. The logical conclusion is the US has nothing but conjecture and a pack of lies. What Would Really Happen If California Seceded?